This puzzle involves a high price per gram, and the gold reference was meant to lead you in that direction. We already did gold. My mom recently saw something in the sky above Reno. Now I'm hearing rumors of -- I kid you not -- zeppelins. Now this one is truly cryptic. You must be playing cat and mouse with us. Have to have coupla pints o Guinness and scratch my silky chin over it. I had just started looking at pictures of cathedrals and figured out quite a few that it wasn't. Then came the rather helpful reference from a stout fellow. Than I was as stuck as that cat to that mouse in that tube of that Christchurch organ. The first clues were the flying buttresses and the cars driving on the left. Narrowed it down considerably. Very few Romanesque/Gothic cathedrals in South Africa and India. And it was certainly not in the Kamchatka Peninsula, either. Riiiiiiiiiight, and they drive on the right . . .
Not still standing, is it? Ah Fook lived a few dozen miles away, but this event happened after his time. I believe Mick Jagger has been spotted in the area, too. It shows up in Google Maps, so it was standing when they took the picture of that area. Some call it the Fooking Cathedral, but it wasn't shaken down. if it where I think it is, I visited it in 2004 on the way to The Routeburn. The quake was Feb 2011. I think it unrepairable so will be torn down the rest of the way. I may be wrong. Wonder if part of the cathedral design is a rubber stamp and CXV 115 is somewhere else? 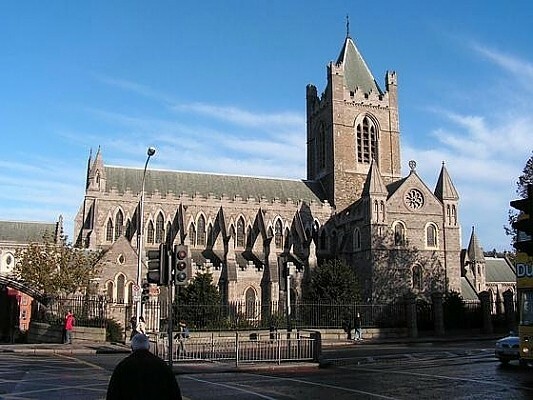 The origins of Christchurch Cathedral date back to the plans of the Canterbury Association who aimed to build a city around a central cathedral and college in the Canterbury Region based on the English model of Christ Church, Oxford. Neither your cathedral or the cathedrat we are talking about could possibly be invaded by snakes. the cathedrat still stands. could possibly be invaded by snakes. PS looking back at saltydogs comments I see that he got it a long time ago. By the way, the "cathedrat" would be known as a "Joycean Literary Device", though, as far as I know, he never used it. It was 1934 -- a DC2 and a lot of city lights. Generated in 0.051 seconds in which 0.039 seconds were spent on a total of 15 queries. Zlib compression disabled.